I also felt the need to create something lasting to honor him, so I began pulling together the genealogy research on the VOGT line I’ve been working on for the last 24 years. I ended up putting together a 68-page book that traces his paternal lineage – following his VOGT name – back nine generations to his 7th-great-grandfather Hermann VOGT, who was a butcher (the meat-cutter kind, not the mass murderer kind!) in Lich Germany in the 1500s. 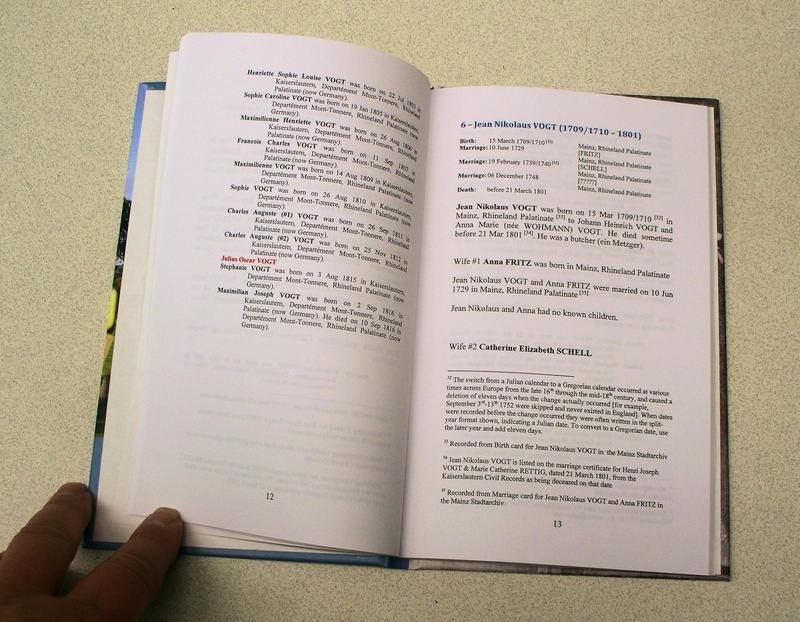 I used an on-line self-publishing house (http://www.blurb.com/) which could provide the book in three formats; softcover, hardcover, and deluxe hardcover with a dust-jacket, all for a reasonable price. The party happened last Saturday and was fantastic. I invited all of his descendants PLUS my cousins from my mother’s Irish side. I mounted genealogy charts that I had printed on a plotter around the dining room and had everyone in attendance put a smiley-face sticker next to their name on the charts to verify that they had been there. 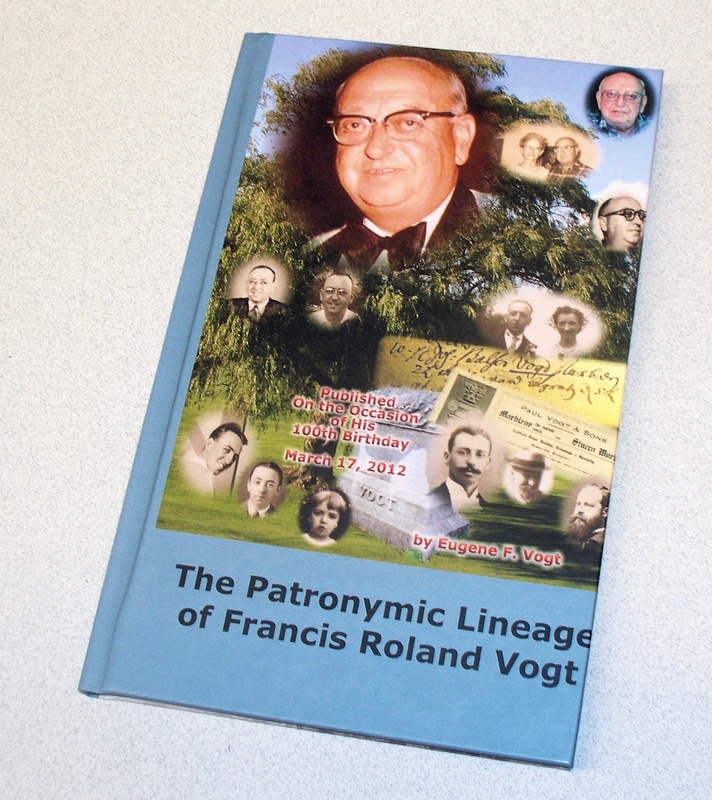 The genealogy book in Dad’s honor, titled “The Patronymic Lineage of Francis Roland VOGT” was revealed at the party. I had a sample copy of each format and people who wanted copies could order them for later delivery. We had 37 relatives (descendants of my father AND my 100% Irish cousins from my mother’s side) and 3-4 interlopers (fiancés and boyfriends/girlfriends of grandchildren and great-grandchildren). My sister and her son and grandson even Skyped in from Colorado for the entire party. My war-bride aunt was there (she lived in Paris under Nazi occupation; the last of her generation, she turned 94 on Sunday so it was also a celebration for her too). WBUR (Boston University radio) broadcasts Celtic music over the internet so we tuned that in on our internet radio connected to the house sound-system so it was playing inside AND OUTside – all Celtic music, no ads, no talking. I grilled hamburgers and hot dogs for whoever wanted them (I told everyone the hamburgers had GREEN slime instead of pink slime) and my sister made do-it-yourself corned beef sandwiches (she braised the beef in Guinness first before cooking it). I bought an enormous cake from BJs that said “Happy 100th” in big green letters with shamrocks all around. We had plenty of Guinness and other brewed refreshments, along with red and white wine, Irish whiskey and “Irish Mist,” and soda and water for the kids and non-alcoholic drinkers. It was a great party and we had a great time visiting with some cousins we hadn’t seen in years. Bringing the extended family together in honor of the man was a worthy activity indeed! This entry was posted in Family, Genealogy. Bookmark the permalink.